Our Tai chi school in china is set in a beautiful Qing dynasty house which we have lovingly renovated for training purposes to allow our students to connect to the traditional school environment which has nurtured all the great tai chi masters. 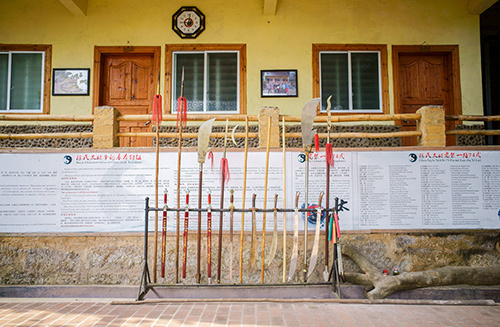 The school it is made by 3 buildings where you can find a smaller training areas, with a beautiful open courtyard out front and a traditional indoor training space and two bigger outdoors covered training space surrounded by Qing dynasty houses of the village. The school buildings also contains our private single/double/family rooms with shared bathroom or ensuite bathroom. A small courtyard area at the rear offers the shared facilities for the school including bathrooms, shower areas, and shared laundry facilities. The buildings also have an outdoor/indoor tea/dvd room and an indoor kitchen and dining area and catering facilities where our chef cooks up an excellent selection of traditional and local Chinese dishes. We can also cater easily for vegetarians. We have also just added a new mountain view training area, which is based behind the school on the side of a carste mountain commanding great views over the rest of the village and out on to the mountains beyond. It provides a great area to practice meditation and Qi-Gong or simply to relax, drink tea and look out over the stunning scenery of the valley. We also have bikes available at the school to use for free and we can help you book tours, and give some great local advice. on the many things to do in your spare time when your not training, or if you wish to go out and explore the magical areas around Yangshuo. Our Traditional tai chi school in china is based in the small farming village of Yima, A beautiful 15 minute ride from the main town of Yangshuo. Yima Village lies at the entrance to the renowned Yu-long scenic area renowned for its famous carste mountain scenery. There is a beautiful route winding its way along the Yu-long river dotted by small farming villages, fields of rice and yellow flowers. Yima village sits in a small valley surrounded on all sides by carste mountains, with rice fields dominating the base of the valley. It is connected to Yangshuo with a good quality road running both into Yangshuo Town and into the Yu-Long scenic area.